7’6″ 3-wt, 3-piece, 2 1/16 oz. The Sage 376-3 Dart is the most versatile creek rod in this series, equally capable with a dry-dropper as with a small dry fly. This is the first model I cast in the lineup and the standout in the. I cast the Rio Creek WF3F on the rod and to call it a perfect pairing is an understatement. I instantly felt like the rod and the line were meant to be together and I confirmed this by casting another line or two on the 376-3. Fish the Rio Creek WF3F on this rod. The very first thing I wrote in my casting notes was Holy Sh*t! I was instantly impressed and my expectations were certainly exceeded. The DART 376-3 is a dreamy casting and deadly accurate creek tool. This rod reads your mind and delivers the fly where you’re looking whether you’re casting overhead, roll casting, side-armed, pendulum cast, reach cast, dump cast, super close, reasonably far, the DART 376-3 left me wanting nothing more. No pun intended, but this rod throws dart-like loops automatically. The rod tracked true, feedback was instant and expected, and the cadence could be tuned to the caster. Want to sit back and wait on the cast? Go for it, the 376-3 is remarkably stable with line out the back. Have a quicker casting stroke and tend to push the fly too much? Grab one of these, the DART will absorb some of that and keep that caster in the game. There is only one thing that this rod does not want to do, and that is cast out past 50 feet with the Creek line. Be real with yourself, can you actually cast a 3 weight 50 feet? If you answered yes, I will ask why? This is a creek rod and it is tuned and optimized for that environment, and I believe it to be the best 7 foot 6 inch 3-weight I’ve cast. Go out there and give one a spin, or stop by the shop if you’re in Telluride. There will be a DART 376-3 in the demo lineup as soon as I can get one. Sage really nailed this whole series by shortening the rods to true creek fishing length. Paired with a Rio Creek line, the 376-4 Dart is an easy casting rod, virtually unsurpassed for presentation qualities at short distance. The Dart is accurate and automatic, without feeling “stiff.” The Creek Line is absolutely critical to performance at short distance, however. 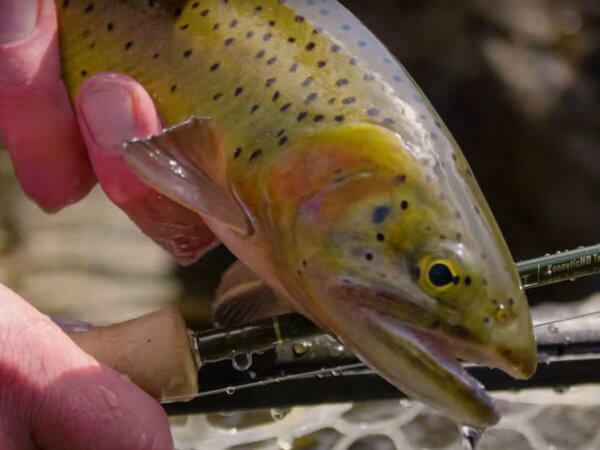 We’ve been fishing Darts on the cutthroat creeks of the San Juan Mountains all summer and find them hard to improve for accuracy, feel and fish fighting qualities. The Dart 376-4 generates enough line speed to fish longer leaders on more broad waters, but you’ll want an SA Trout Taper or Rio Gold for those situations.